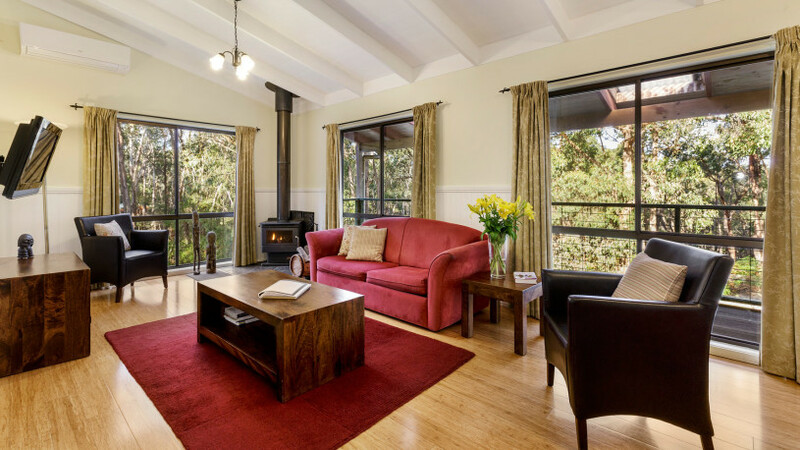 Countrywide Cottages offer 4 star, pet friendly, selfcontained cottages in the Otway Ranges. Here at Countrywide Cottages we pride ourselves on providing high quality accommodation with all the modern facilities within the idyllic Australian bush. We know your dog is as much a part of the family as the people within it. This is why we go all out to make them feel at home. Each of our cottages have open plan living/lounge, dining and kitchen areas with cosy wood heaters, as well as split system heating/cooling. Fully designed and equipped to allow guests of all mobility levels to enjoy their farm stay holiday, having been specially built for wheelchair accessible accommodation Otways. Countrywide Cottages offer 4 star, pet friendly, self-contained cottages. Choose from our 4 secluded Great Ocean Road accommodation cottages spread over 26 acres of farm and pristine bushland. Ideally located in country Victoria only 25 minutes north of Lorne and under 2 hours from Melbourne, this is the perfect accommodation on the Great Ocean Road. 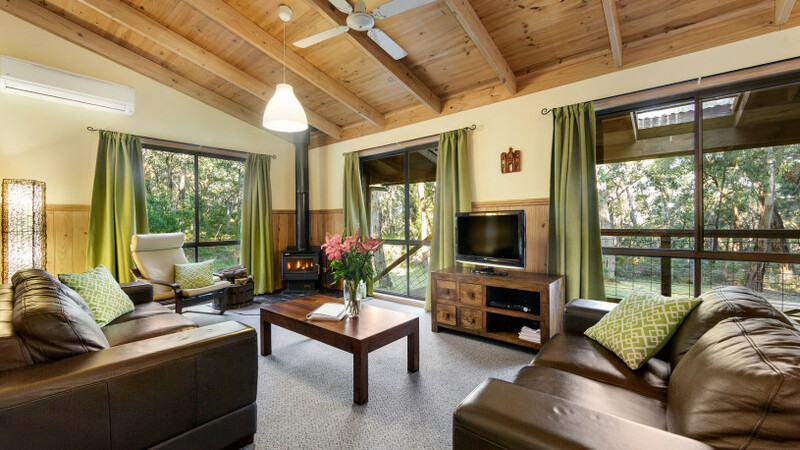 One of our cottages provides purpose built wheelchair accessible accomodation Otway Ranges. 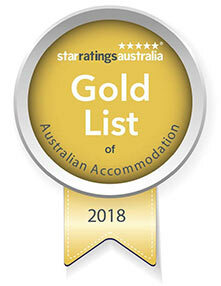 Our guests have reviewed us into the Gold List of Australian accommodation providers – now number two in Australia! 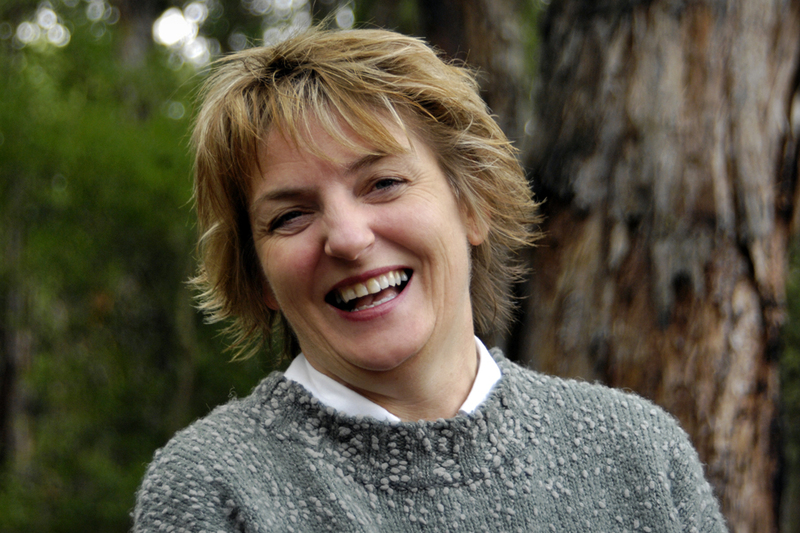 Di Schulze, your host & owner of Countrywide Cottages. Wow – we’ve made it back on the 2018 Gold List, now Number Two in Australia based on our guest reviews across the internet. Thank you for keeping us up there! 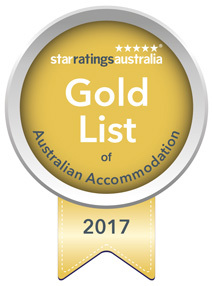 We are very proud to announce that we have reached the Gold List for Best Guest Experience with Star Ratings Australia and are now amongst the Top Ten in Australia. Wild! Self contained cottage with additional value of wheelchair accessibility. One of our 3 bedroom self contained cottages, the Villa sleeps up to 7 people. Countrywide Cottages is ideally located for taking a trip along the Great Ocean Road. The inland route takes you to the Otway Fly, Lake Elizabeth or the 12 Apostles, and Lorne is just 25 minutes drive through the beautiful Otways. A perfect base to explore the fabulous Otway Harvest Trail showcasing the unique wine, beer and produce of the Otways region. 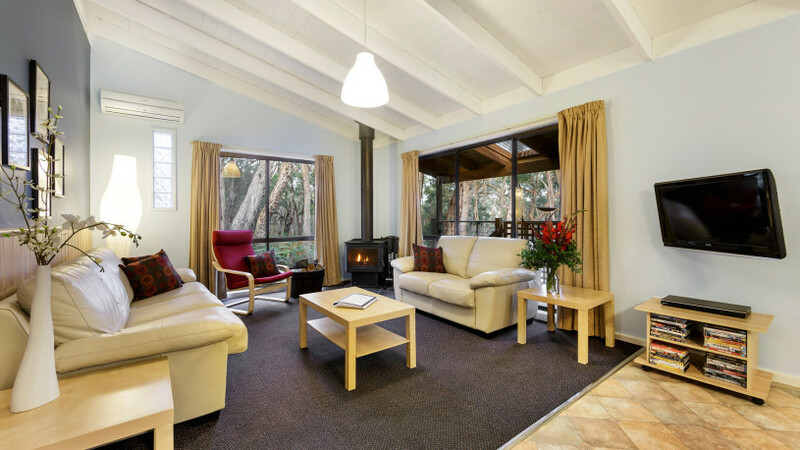 Our large property is ideal for long bush walks or mountain biking, bordering the Otway Forest Park. We also have enough room for a campfire outside your cottage on those starry nights and many of our guests have enjoyed toasting marshmallows by the cosy fire. We are very happy to have worked on our own great specials and these further great deals below with some amazing local folk whose business can make a wonderful addition to your time with us. Brae Restaurant’s food images here photographed by Colin Page. Featuring the best of farm stay accommodation here in the fabulous Otways, each of our spacious Countrywide Cottages has 2 or 3 bedrooms sleeping anywhere between 5 – 9 people and are set among the gum trees for a truly relaxing country experience. Fully equipped with modern facilities including entertainment and a well equipped kitchen, the cottages are individually decorated and provide 100% dog friendly accommodation Otways. 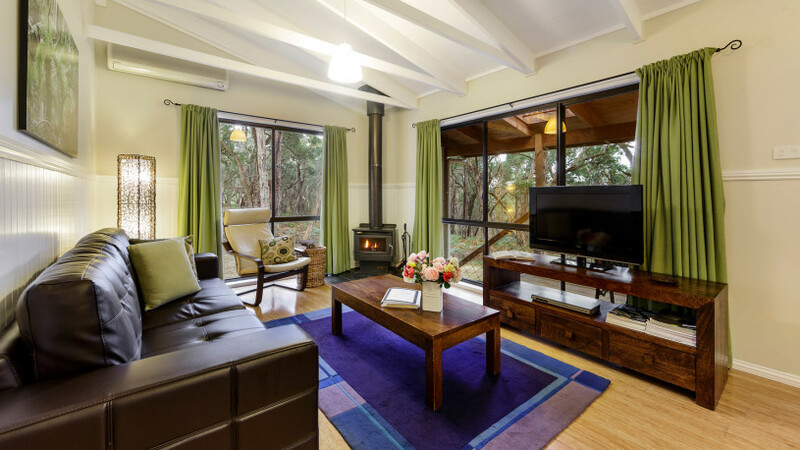 Our large property is ideal for long bush walks or mountain biking, bordering the Otway Forest Park. We also have enough room for a campfire outside your cottage on those starry nights, (summer fire restrictions apply), and many of our guests have enjoyed toasting marshmallows by the cosy fire. Kids love our animals. While staying in our pet friendly accommodation, they are welcome to come up and visit our array of critters – the alpacas, sheep and chickens. Eggs are finders’ keepers! One of our hidden treasures is our recreation area with its pioneer buildings. Built in a rustic style, it offers a pool table and other games, and ample space for a kick of the footy. It’s also a great place for groups staying in our Countrywide Cottages to come together and have a barbeque, with a gas BBQ and undercover and outdoor seating. Add an extra zing to your break away with one of our great new packages. “Sleep and Smile” with us and have our wonderful partners, Ragamuffin Pet Photography come and capture you and your dog on film. “Sleep and Seek” the elusive platypus at Lake Elizabeth with our partners at Otway Eco Tours. Or try our “Dogustation menu” package – bring your dog along and use Countrywide Cottages as your base for the dining experience of a lifetime at the world renowned Brae Restuarant. “We’ve travelled the world a number of times and have stayed at many four and five star hotels. Are animals other than dogs welcome? Yes! We welcome horses to our property. We are proud to provide the best pet friendly holiday accommodation Otways! There are paddock facilities at your disposal. Please BYO tack and hay. How do we access our cottage on late arrival? As we live on site at our Otway Ranges self contained cottages, we are almost always able to greet our guests personally at reception. If we are aware that you are checking in late, we will make sure the lights are on in the cottage and the fire lit in cooler months to make for a cosy arrival. If we are unable to greet you personally, we will leave a detailed note at reception with the key to your cottage and clear instructions as to how to find the cottage. Children aged 2 and under can stay for free when staying with full paying adults and using existing bedding. Countrywide Cottages is proud to be a 100% non-smoking accommodation provider. We do however, provide sand boxes on the verandahs of each cottage and at Ned’s Retreat. There is ample free parking around each of the cottages. Is my room cleaned daily? We prefer to give you privacy and make a habit of staying away from your cottage during your stay. Guests staying 7 nights or more receive a free weekly service. If you need linen changes for whatever reason, feel free to come up and see us at Reception. When can I check in and out? Check in is at 3pm, check out is at 10am. Early check in and a later check out can be organised by prior arrangement. Where are Countrywide Cottages located? Our location is 1205 Winchelsea Deans Marsh Road in Bambra. Be careful to include the full street name on your GPS or you may be taken too far towards Lorne. Your GPS may require you to search “Winchelsea South” rather than Bambra to find us. We are in a rural/bush setting, 25 minutes drive north from Lorne, and 10 minutes drive south from Winchelsea. When you enter the property, you will see our house with Reception attached at the end of the drive. We will be there to greet you! What happens in the case of Bush Fire? When travelling in the country during fire season, you should always be aware of the fire conditions in your surroundings. You should download the Vic Emergency App and set a minimum of a 20k radius around Countrywide Cottages, or where ever you plan to be. This will keep you informed of incidents in the area, provided you have mobile coverage. (Vodaphone customers receive no service in our region. Telstra and Optus are better but not always perfect). It is also a great back up to keep an ear out on 774 which reports incidents when they are known. While we make every endeavour to be prepared, the staff of Countrywide Cottages DO NOT HAVE EXPERTISE IN THE PREDICTION OR DEFENCE AGAINST BUSHFIRE. If a fire broke out in the area, IF IT IS SAFE TO DO SO, we will make our way to each cottage to give our guests clear instructions as to the best action at the given time. If the fire is close and the roads are potentially dangerous, we stick to our plan of having guests come to the house and shelter there with us. There is a comprehensive fire and evacuation policy in each cottage which you should familiarise yourself with upon arrival. To read it prior to your arrival, click here. If you smell or see smoke while visiting the Otways, carefully consider your options. It is best to head in the opposite direction to the fire activity. DO NOT head towards the coast unless it is the only possible option available to you. If you are here at Countrywide Cottages when you see or smell smoke, pack your family, dogs, phones, chargers and medications ONLY and come up to the house. Please don’t waste time by packing your non-essential food and personal items. We are most likely to be heading to the cottages to let everyone know the best action, as well as getting our house ready for refuge if it is safest to do so. The safest action MAY be to leave. If so, unless the fire is coming from the north, we would tell you to head that way – ie turn right out of our driveway, and head to Geelong or Colac, depending where the fire is situated. This means that conditions will be hot and windy. If a fire starts and takes hold, it may easily become uncontrollable. We strongly recommend that you do not head south to Lorne – the roads in and out are minimal and will already be very busy during summer. If you wish to spend the hot day at the beach, we recommend Whites beach in Torquay and between Rocky Point and Jan Juc. To see these on a map, and for more information on Dog Regulations in the Surfcoast click here. We would avoid going further west along the Great Ocean Road, as there are a lot of folks that far down the coast who will on that road with you if an emergency comes up. There’s also Geelong and the Bellarine Peninsular….click here for some great options for you and your dogs to hang out in. You could also head towards Colac where dogs are permitted on leash in the Colac Botanical Gardens, along the Lake Colac Walk and even out to the West Barwon Reservoir which offers many easy and shaded walks. 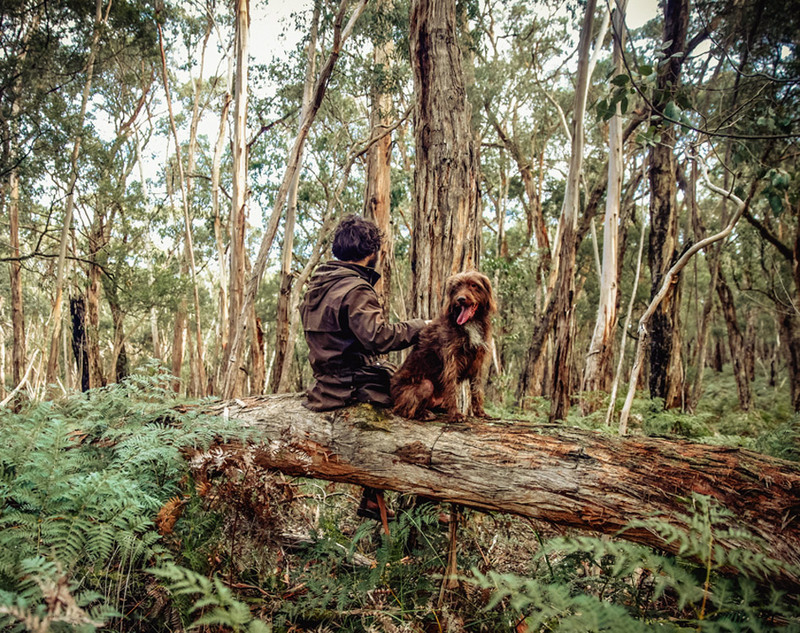 Click here for pet friendly guide in the Otways. This is just one level down from that on Black Saturday in 2009 and means that conditions will be extremely hot, dry and windy. If a fire starts and takes hold, it will be uncontrollable, unpredictable and fast moving. Please take this very seriously, as we do. It’s a grea day to plan to be out of the danger zone. For your safety, part of our fire plan is that our guests GO OUT FOR THE DAY. Take your dogs with you, as well as phone chargers, medications etc. If a fire is in the area, we can not protect you or the cottages, as well as ourselves and our home. While you are out, keep an ear out on 774 radio for alerts to fire in the area. If you haven’t elardy, please download the Vic Emergency App and set a wzone of 30k’s around Winchelsea South. This will notify you if any fires are in the area (provided that you have mobile coverage – see note above). See above for recommendations as to where to spend the hot day with your family and dog/s. Provided conditions ease and there is no fire in the area, it would be safe to return later in the day – however, please DO NOT return to Countrywide Cottages without contacting us first. If this means an end to your holiday with us, we are very sorry – we would prefer you to be safe than put in a highly dangerous position. We would negotiate with you for a holiday to be taken at another time. Is there internet and mobile phone access at the Cottages? As with many country areas, we have limited mobile and internet reception. Telstra provides some coverage within the cottages, but unfortunately all other providers are not reliable and it is unlikely you will be able to obtain mobile reception. There is very little internet reception on the property. For urgent internet access, we can provide you with assistance in the office. Do I need to bring my own dog bowls and dog food? Yes…please bring along your dogs food. We set up one dog bed per cottage but provide enough dog bowls and treats for each canine guest. We also supply furniture cover sheets for the couch potatoes so that everyone can fully enjoy our amazing Victoria dog friendly accommodation. If you have any other queries? Please don’t hesitate to contact Di at Countrywide Cottages Surf Coast! She will be able to help you with any of your questions or concerns!